I have a few regrets related to my undergraduate education at Dartmouth. One of them involves a course I didn’t take. 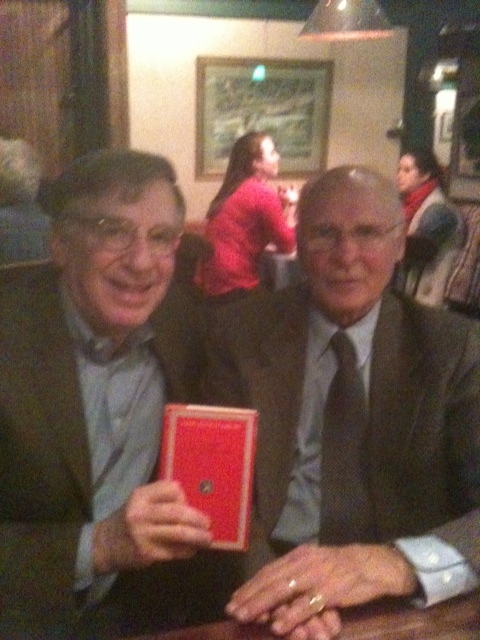 Having taken a fantastic Latin course on Ovid’s epic poem Metamorphoses from Classics Professor Edward Bradley in the winter of 1970 — that’s me with my old copy of the Metamorphoses in the photo with Professor Bradley at the left — I signed up for his course on the Roman poet Horace the following year. The first assignment required us to read and analyze the metrics of Horace’s famous ode to Pyrrha (Book I, number 5), the faithless lover. Working on the paper, I realized I wasn’t quite up to the task. I dropped the course rather than seek out the help I needed to write the paper properly. Forty-two years later, this past fall, my youngest daughter took introductory Latin with none other than Professor Bradley, now mostly retired but working when requested by the Classics department. Hearing my daughter talk about Professor Bradley brought back a lot of memories. Metamorphoses, there’ve been a few. One thing, however, hasn’t changed. Dartmouth students today view Professor Bradley with the same mixture of respect and affection that I have for him. At the conclusion of the introductory Latin class last December, his students petitioned the Classics department to ask him to teach the next Latin course in the sequence this winter, and he is therefore back at it. Visiting my daughter at school last weekend, I asked Professor Bradley if he would meet me for coffee. He suggested something “more spirituous.” He didn’t remember me from Adam, but he remembered the Ovid class and one of my fellow students in the class, Karl Maurer. Karl now teaches Classics at the University of Dallas. Professor Bradley remembers him warmly as the best Classics student he ever had. Professor Bradley loves teaching undergraduates. His former students are some of his best friends. Seven of them joined him for dinner when he formally retired from the faculty in 2006. No pun intended, he is a classic Dartmouth teacher. If the school is good, it’s because of teachers like him. I greatly appreciated that course on Ovid, but I wish I had stuck with the course on Horace’s lyric poetry. I told Professor Bradley how much I regretted having withdrawn from his Horace course. He would not assuage my regret; he confirmed that I missed a good one. It was the only course he ever taught that was devoted to Horace. He remembers it as something special. I told Professor Bradley how much his Ovid class had meant to me. He conveyed a love of the poetry. He inspired me to study ancient Greek and encouraged my interest in writing. His comments on my paper for the class have stayed stuck in my head over the years. He told me he was delighted to hear how I remembered his class — he felt that he hadn’t matured yet as a teacher. It was 42 years ago; we’ve all had our metamorphoses.